Jorge De La Rosa deserves his salary. He pitched 6 innings again and allowed only 2 runs. Jorge has now 16 wins and he is leading NL in wins. Matt Belisle pitched in 8th inning and he allowed 4 hits, 3 runs (2 earned). But Brothers in 9th showed great performance and saved the game again. It was his 15th save of the season. Offense was better than game before. Rockies had 11 hits and scored 7 times. 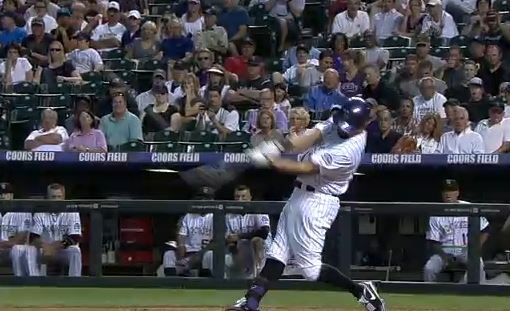 Todd Helton hamered solo jack. It was his 12th HR this season 366th career´s. Maybe his last. Tulo and Cuddy had 2 RBI each. Josh Rutledge back in MLB was 3-for-4 and had 1 RBI.Arenado didn´t finish last game with with a jammed thumb, but he is day-to-day. Today will Rockies move to San Diego to new series with Padres.